Having a good taste is a necessity not only for cooking, but also when preparing and serving the dishes. Best ingredients and the best tools for extraordinary taste - that's the pure "Cooking Culture"! Bring the best of German engineering to your kitchen with AdHoc! TEA STICK is the splendid tea infuser for all tea varieties. Use the integrated spoon in the handle to scoop the loose tea from its container and to fill it in the filter. Brewing adept tea will be so easy: let it brew - stir - put the tea stick back in its stand. The flavor can fully develop. It is handy, easy to clean and has a precious design. Modern tea stick infuser. Fill with your favorite tea and swirl in hot water to infuse. Designed for loose leaf tea by Floz Design of Germany. 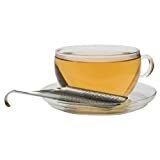 Twisting Stick Infuser with Lily Pad twists open and allows tea to steep. Twist to close and rest on drip-free lily pad base. Silicone plug on base snaps closed for tight seal. 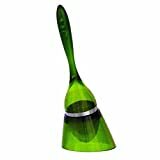 Lily pad base keeps surface clean and dry. This Teastick makes it easy to brew your own cup of loose leaf tea. 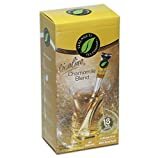 This ultimate infuser has no breakable mechanisms, is aesthetically pleasing and provides traditional loose leaf tea service. 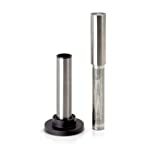 The innovative design provides optimum flow for splendid steeping and incorporates a fill-line guide. 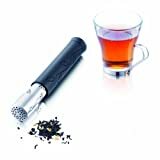 The Teastick fits nicely into glasses and mugs and is ideal for a excellent 10-14 ounce cup of tea.5-1/2" x 1"
Tea Infuser Wand, 6.25" / 16cm, stainless steel. Perfect for individual cups of tea. Tapered opening easily scoops loose tea for the immaculate cup of tea. Bottom cap is removable for easy cleaning. Dishwasher safe. Gift boxed. With innovative designs and contemporary finishes, Oggi’s kitchen, bar and bath wares are truly tomorrow’s house wares today. Oggi’s Tea Stick Infuser is no exception. Made of stainless steel, this tea stick will last for years and will not retain unpleasant tastes and smells. It's easy to use – simply place loose tea in one end; submerge other end in cup of hot water and voile. within minutes you'll have a cup of fresh, tasty and healthy tea. Attractive design and stainless steel finish. Contemporary and convenient design. 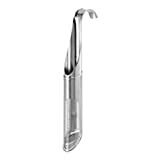 The Vacu Vin Tea Stick scoops up your popular loose tea leaves in the stick. When placed in a cup of hot water to seep the tea leaves release better flavor as they are able to flow freely. A convenient slide mechanism squeezes the water out of the stick so that it won't drip or stain after use, and the tea leaves are easily pushed out of the stick for cleaning. Sit back, relax and unwind with this delicate herbal blend. The flowery taste of chamomile is highlighted with subtle notes peach and lemon. A mellow yet enchanting brew made with real fruit. The ultimate infuser for tea enthusiasts features intuitivem, scoop-slide-steep functionality while it reflects the aesthetic of traditional loose tea service. 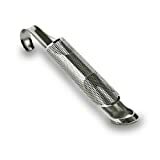 Durable enough for industrial use, it has no breakable mechanisms and is constructed entirely of 304L stainless steel with holes small enough to infuse the finest of teas. The innovative design provides optimum flow for perfect steeping and incorporates a fill-line. Welcome to La Cafetiere, the real hot drinks experts. Our classic Cafetiere, which is now in its 40th year, was the original plunger-type coffee maker to be marketed in the UK. This award-winning product is now widely recognised as a Design Icon by houseware specialists worldwide and, of course, remains a beloved with customers to this day. As a consequence, the La Cafetiere brand has become synonymous with both design classic and its reputation for quality and innovation. The last few years have seen La Cafetiere develop further this enviable reputation by widening our availablity to the market place. Historically there has been a special emphasis on coffee; however, we have identified trends that have led us into the resurgent market for tea and even more recently into the growing the drinking chocolate sector, through the development of our La Chocolatiere range of products. La Cafetiere continues to work closely with professional partners in all areas. This has allowed La Cafetiere to expand on its familiar range of coffee makers and into the complete hot drinks story.